The VDRC gives a HUGE thank you to Horse Council BC! The VDRC is proud to announce our 2019 Corporate Sponsors! Greenhawk Kelowna and Greenhawk Kamloops are returning as one of our corporate sponsor’s together for the 2019. Both Greenhawk Kelowna and Greenhawk Kamloops qualify as being “out of town” just like many of our members,and we are very grateful for their support for the 2019 season. Priscilla & Company Remax will be returning as a corporate sponsor for 2019. We thank you her for her generous support. We are excited to announce that Le Tack Truck is back again for 2019 as a corporate sponsor. We thank Sara for her continued support to the VDRC. **If you are interested in becoming a Corporate Sponsor for the 2019 season. Please contact Jeff Demetrick for more information. Thank you! VDRC has many other sponsors who contribute to our horse shows, fashion show, clinics and other events. Without their generosity, the Club would not be able to operate with success. Interested in sponsoring the Vernon District Riding Club? View the following for more information about how you can support VDRC. The VDRC is supported by many sponsors. Our major sponsors contribute to the funding of our Club in a global way. 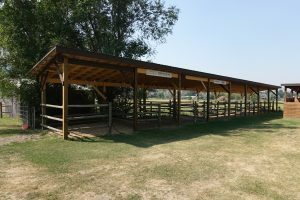 The Club is supported by Greenhawk Kelowna/Kamloops, Priscilla and Company Re/Max, The Tack Shop Okanagan and Lavington Pellet, as a result our riding rings and club house are named in their honor. Please support these local businesses, as they support our riding venue and activities. ‘Friends of the VDRC’, are local businesses that have generously offered VDRC members discounts on select items in their stores.